The City is working on four BRT projects that will fill important gaps in the primary transit network so Calgarians will have even better transit service. The BRT that works its way through Ward 4 and Ward 7 will be up and running in fall 2018. Construction is ongoing. Below is more information on the project. This will also compliment the Green Line when it begins operating in 2026. The City has finished the utility and concrete work for just over half of the new BRT station platforms for the North and South Crosstown BRT. Crews are wrapping up construction on the platforms for the season, and will start putting the new shelters on the completed platforms throughout the winter. We expect the materials for the BRT stations will be arriving in February, and it should take about two weeks to install each shelter. When we built some of the BRT platforms it was necessary to remove existing transit shelters, and because crews will be out in a few months installing the new shelters we do not want damage the new concrete at these stations by installing a temporary shelter. We thank transit riders for their patience as we install the new BRT shelters, and we expect that all of the shelters will be installed by early spring. The remaining half of the BRT stations will undergo utility and concrete work in the spring, and will have shelters installed in time for the BRT network to open in late fall of 2018. If you’d like to receive project updates, be sure to sign up for our mailing list. Thank you to everyone who provided feedback on the North Crosstown BRT route, station locations and design. For a detailed summary of the input provided, please see the What We Heard Report. Of respondents who said they don’t currently use Calgary Transit, most indicated the new North Crosstown BRT would encourage them to use Calgary Transit. The North Crosstown BRT is a Council-identified priority in Calgary Transit’s strategic plan, RouteAhead. The North Crosstown BRT project is one of four additions to The City’s primary transit network. 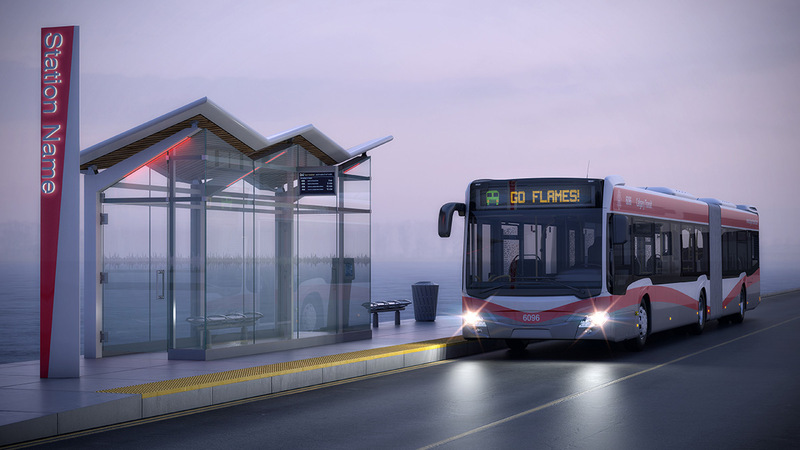 The four new routes fill important gaps in the existing transit network and provide Calgarians with reliable, direct connections to major destinations. When service starts in 2018, the BRT will operate seven days a week with buses running every 10 minutes during peak hours (6:30-9 a.m. & 3-6 p.m.) As ridership grows, the BRT will operate seven days a week, 15 hours per day with buses every 10 minutes. Queue jumps are reserved for buses at signalized intersections. Buses enter their own lane and get an advanced green light before other vehicles at the intersection, allowing them to get ahead of traffic and avoid congestion delays. Calgary already has a number of transit queue jumps, including 16 Avenue and 10 Street N.W., Memorial Drive and 5 Avenue S.E. and Marlborough Drive and 52 Street S.E. The City is committed to keeping the public, residents, and businesses informed during construction. Please sign up for email updates (click on the “North Crosstown BRT” box on the sign up page) to receive updates about the project. The City is developing concept plans for widening 16 Avenue North from four to six lanes between 19 Street N.W. and 29 Street N.W. Currently, this section of 16 Avenue North has only two lanes in each direction. Few impacts are expected because The City owns most of the required right-of-way (land). The project team will work with the community and adjacent land owners to identify and address concerns. The eventual widening of 16 Avenue North in this section will provide lane continuity, improve road capacity and safety. It will also provide an opportunity for a BRT station next to University Drive N.W. and McMahon Stadium.